I was born April 30, 1926 in Chicago, Illinois. 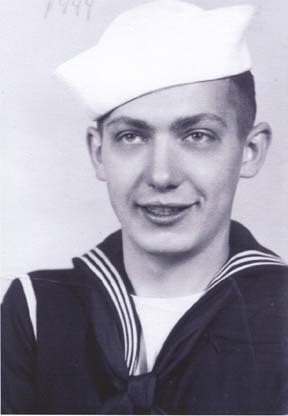 February 1944 I was a senior at Lane Technical School in Chicago. I left school; had my mother sign my enlistment papers and rode a train to Farragut, Idaho to begin basic training. A few days after basic was over, I was on the muster list to serve on the USS West Virginia. I worked in the post office and was in the 6th Gunnery Division on the 5 inch guns. We bombarded shore emplacements at Leyte, sunk a battleship in the Surigao Straits, was at Luzon, Iwo Jima, Okinawa and Japan. We took a kamikaze hit on April 1, 1945, Easter Sunday - four sailors were killed and 23 injured. The plane hit on the port side above the 5 inch gun mount. That day I will never forget! I was discharged in May of 1946 and returned to Chicago. I worked 50 years in the printing industry until I finally retired at the age of 70. Moved out of Chicago 44 years ago and have lived in Wisconsin ever since. I'm married, have eight children and 17 grandchildren and 2 great-grandchildren.